Abstract - In today's era, we have an ocean of temperature sensing devices available in the industry. In this project we propose a compact and portable design of a small range digital thermometer, using 1N4148 diode as a temperature sensor and Ngspice as a tool for simulation. The temperature coefficient of the diode, -2 mV/Â°C is exploited for this application to create an accurate electronic thermometer. The diode is connected as feedback to an opamp, whose output voltage will be a function of temperature. 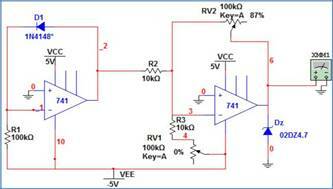 It will be further amplified by a second opamp, and presented as input to an ADC or voltage scaler. Accordingly, a digital multimeter/display unit can be interfaced to view the reading. The temperature sensitivity and the min/max temperatures are found using Ngspice simulator. linearity of temperature-voltage relationship for temperature ranges of 0 Â°C to 100 Â°C in a p-n diode, while profiling its voltage, current and temperature behaviour. It was also demonstrated by Godwin  that the 1N4148 diode has linear voltage variations with temperature in the range âˆ’40 Â°C to 150 Â°C. This property is being exploited to make a digital thermometer. The main requirement of today's world is to have an easily portable temperature sensing instrument, fitted with a convenient display unit. Most of the temperature measuring instruments available today are either RTD or thermocouple digital, or thermistor digital thermometers. Most of these require a current sensing device either for calibration, or for measuring purposes. The goal of this project is to propose a device which will combine both these capabilities simultaneously. operational amplifier IC2. Preset RV1 is used to set the zero-reading on the meter and preset RV2 is used to set the range of temperature measurement. The expected output voltage range of IC2 op-amp is 0-5V. This voltage can be given as input to an n-bit ADC which will produce an n-bit digital equivalent corresponding to this voltage. This digital output can be fed into an integrated display unit, or to an LCD / 7-segment display interfaced using embedded systems. [Fig.1.]. One more flexibility is provided in this model. Rather than using a separate display unit for display, the output voltage can be specifically level-shifted and/or scaled so that numerical value of that scaled voltage in mV is equal to temperature in Â°C. [Fig.2.]. of analyses viz. transient, dc, ac, transfer and operating point. 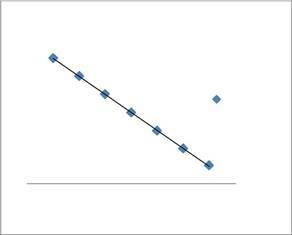 The simulation results were recorded and analysed in Ngspice, and the data was further plotted using Microsoft Excel for a better view. As shown in Fig.4. 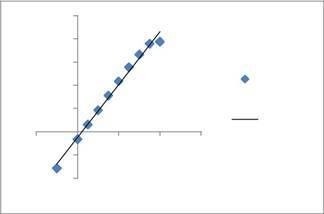 RÂ² value is very close to unity, showing excellent correlation of the obtained results. This result is a characteristic of the 1N4148 diode. We finally compare the specifications of the device desired, and those met by the simulated device.